My wonderful stamping friend Anne Ryan just sent me a parcel full of incredible stamping goodies - key charms, a white gelly pen, white Shimmer spray AND... drum roll... the Asian dreams SU set!!!!! Can you believe it???? I still can't!!!! So I had to create a card using my new stamps right away - this is what it came out. The background for my stamped images is watercolor paper colored by pressing some green and brown Ranger Adirondack ink pads onto a craft sheet, then misting the craft sheet with water and putting the watercolor paper onto the craft sheet, then I dried the paper with my heat tool. When the paper was completely dry, I sprayed some Glimmer Mist onto it and again dried it with my heat tool. I stamped my images with Versamark onto the colored watercolor paper and embossed the images with red-gold embossing powder. The Geisha was punched out with a Marvy Uchida oval scallop punch and edged with purple Colorbox Fluid Chalks. 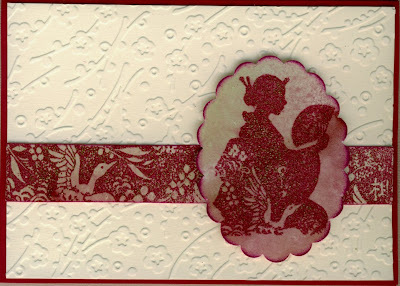 Everything was mounted onto cuttlebug-embossed cream cardstock (Plum Blossom folder), then onto burgundy cardstock.